It turns out public generosity can give complex Tezuka manga second printings, so where's the love for our other lost English-edition manga treasures? Like, say, DEVILMAN: THE DEVIL'S INCARNATION, out of print now for 24 years? Just like the Beelzebub of legend, Devilman has appeared in many forms - as the blue-skinned superhero of a Toei TV cartoon, in two late-80s OVAs, co-starring with Mazinger Z in the high-art cinema MAZINGER Z VS DEVILMAN, as a devil-munchkin in CB CHARA GO NAGAI WORLD, in games for the NES and PSX, and as the star of his own live-action film. And as a lady. 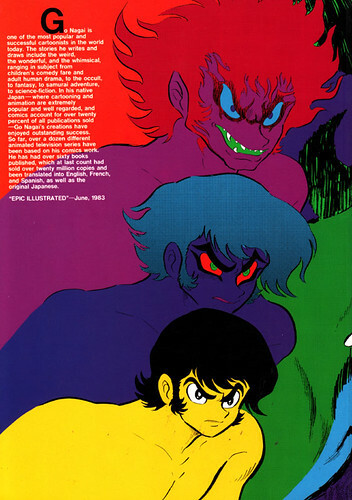 The manga career of Devilman spans 52 chapters serialized in the venerable SHONEN MAGAZINE, a update/remake/reboot titled SHIN DEVILMAN from '79, and appearances in other Go Nagai manga like VIOLENCE JACK. As an apocalyptic, H.P. Lovecraft-meets-the Hell's Angels story of immensely powerful beings from beyond the laws of time and space annhilating each other with savage fury, DEVILMAN can be a sacireligious ultraviolent adventure story or as a sobering reminder of the insignificant part human beings play in the larger cosmos. 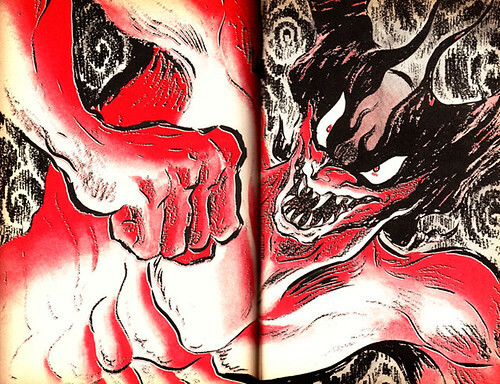 But apart from the shoddy floppy-comic release of SHIN DEVILMAN by Glen "Small Man Syndrome" Danzig's Verotik, the original DEVILMAN manga has never been translated or released in English. Except when it has! 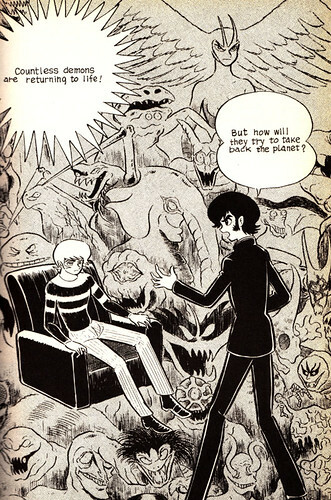 In 1986 Nagai's own Dynamic Productions released a 200+page trade-paperback edition of DEVILMAN in English. THE DEVIL'S INCARNATION was translated, charmingly hand-lettered, flopped to read Western-style, has a garish color cover, and would have been great to see in the mall bookstores of America alongside the Donning/Starblaze ELFQUEST color books, WATCHMEN, and, in a few years, Go Nagai's full-color painted MAZINGER graphic novel. THE DEVIL'S INCARNATION delivers the manga-reading experience magnificently; sized for the American book market, it had great potential to deliver a one-two manga punch to readers and maybe even get "the manga boom" started a decade or so early. DEVILMAN's failure was in distribution. Meaning, there wasn't any. I found my copy in the mid 90s, hidden in a shelf of marked-down books in the back of a record store. This is not what I call "promotion". Was this ever distributed in a reasonable fashion? How did it end up in Criminal Records? Why did Dynamic Productions insert itself mysteriously into American publishing and then just as mysteriously vanish? 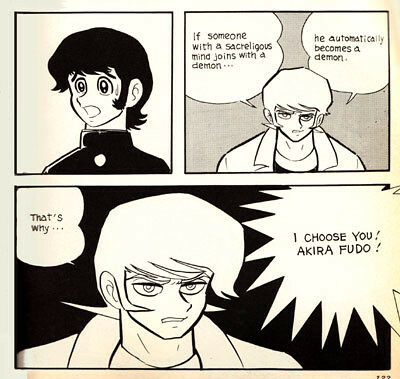 The story, for those as yet untouched by Devilman, is that Akira Fudo, a well-known crybaby and wuss, is visited by his best friend Ryo, who convinces him to merge with the devil Amon. And with friends like that who needs enemies? The combination of Akira and Amon becomes Devilman, sworn to defeat the legions of devils that existed long before mankind and who lay slumbering in the depths of the earth, Lovecraft style. 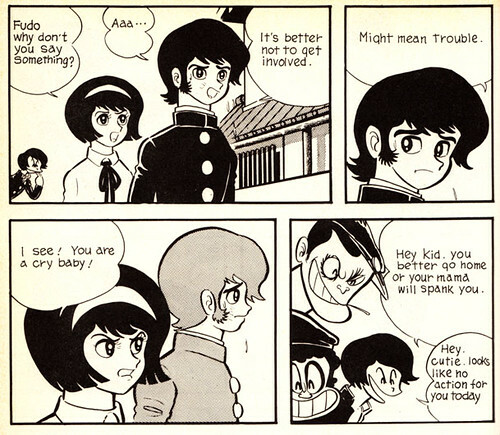 Go Nagai's artwork still retains the cutesy cartoony "Shameless School" look, but when things get real you can see the brushline vibrate and the ink start to get all intense. By the time Akira and Ryo are slugging back whiskey in a basement full of half-naked hippies doomed to be possessed by hideous demons, we have moved into new and disturbing manga territory. Certainly this is not what Americans were expecting from their Japanese comics in 1986 - if it didn't have slick Studio Nue mecha and cute pastel-accented idol singers then America simply wasn't interested, thanks. Alternatively, had an enterprising publisher delivered DEVILMAN to American audiences in 1972, the decadent, violent saga would fit perfectly with your Stooges records and your 42nd Street grindhouse shockers. Viewers of the excellent 1987 DEVILMAN: THE BIRTH video know where the story goes - the Akira/Amon combo defeats a room full of grotesque monsters and realizes his devil-fighting destiny. That's how DEVILMAN: THE DEVIL'S INCARNATION ends, Akira and a battered, unconscious Ryo surrounded by the bloody remnants of a devil army, wondering what the future holds. That's a good question. 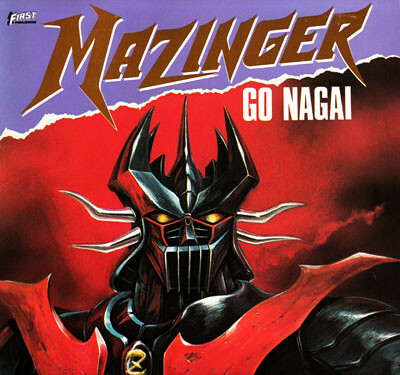 Will this be the only representation given to 45 years of Go Nagai's manga in North America? Or will there emerge a publisher with taste and vision to deliver the raw power of DEVILMAN once again to the English-language world? 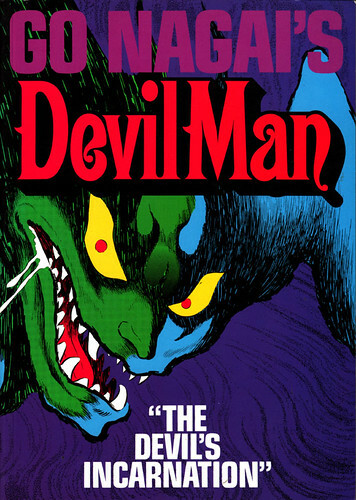 Thanks to Mike Toole for inventing the phrase "Devilman Saves Christmas". Happy Holidays to all and see you in 2012! What can I say about a show that features anthropomorphic animal versions of human beings having adventures - without sounding like one who's joined the Furry Revolution, I mean? Well, two words may serve to relieve the discomfort bubbling up through your pyloric valve- Hayao Miyazaki. Yeah, that's right, Comrade Nausicaa himself, together with Tokyo Movie Shinsha and the Italian TV company RAI, produced this animated, walking, talking dog version of England's own Sherlock Holmes. So put those fursuits away, boys. Originally known as FAMOUS DETECTIVE HOLMES, this show was one of the mysterious gray areas of Miyazaki's resume; we knew he worked on it, but we didn't know when and where and for how long, and more importantly, we couldn't get good copies of the darn things. Well, back in 2002 before Pioneer became Geneon and went out of business, they heard our pleas and released HOLMES on two different 2-sided DVDs. Side One has five episodes in English, and the other side has the same exact episodes in Japanese, with subtitles. Extensive research has determined that the English versions of these episodes come from the same bunch that Just For Kids released on cheap, 6-hour, KayBee Toys Clearance Bin Home Video several years ago. You may have noticed them taking up shelf space next to their Macron One releases. This dub is, however, NOT the English dub that certain sharp-eyed anime fans may have remembered seeing on the Showtime cable channel years ago - that version featured a Sherlock Holmes that was, in fact, referred to as "Holmes", as well as British accents that might be a tad more authentic, for the simple fact that they might actually be voiced by British people. This edition is perfectly acceptable, however. The dubbing is Englishy enough, the transfer is excellent, and we're even given the original Japanese opening and ending credits. The box itself is really classy, and the liner notes reveal several interesting things about the production of HOLMES; namely, that the show was a 1981 co-production between TMS and RAI, originally produced in English, and it was cancelled after 4 Miyazaki-directed episodes, and then two other Miyazaki episodes were completed and shown on a double bill with NAUSICAA, and then they went and got Kyosuke Mikuriya to make twenty more episodes for the 1984 TV season. And now I've given all the surprises away. But even if you know all its secrets, HOUND is still worth watching. There are those among us who shudder at the thought of a period cartoon starring talking dogs; I am one of those people. I prefer my anthropomorphic canines to stick to late-night poker games. However, if you can't trust Hayao to turn even the most unpromising premise into entertainment, who can you trust? Nobody, that's who. HOUND is full of the kind of detailed, hyper-kinetic set-piece action scenes that made Miyazaki memorable. The characters - canine as they may be - are as fully realized as cartoon characters can be, from facial expressions to clothes to nervous habits. And the backgrounds! SOMEBODY at TMS did their homework, because this show features some of the most beautiful background work I've ever seen in an animated television show. Edwardian London comes to life with crowded city streets, train stations, department stores and government offices and the ramshackle apartments on Baker Street where Holmes and Watson relax between cases all realistically and vividly portrayed. Virtually every shot is crammed full of period detail. Other, lesser cartoons would suffocate under such baggage; HOUND thrives on it. That's not to say this show is an exercise in historical accuracy. Great liberties are taken with regards to mechanical contrivances; especially those of a certain Professor Moriarty, the self-styled 'Napoleon Of Crime', whose wizardry at late 19th century gadgetry would only be matched by the similar antics of the character Grandes from Gainax's 1991 series SECRET OF BLUE WATER. Not that I would point the finger of plagarisim at that much-and-justly-maligned series - no, the animation that was shameless in its theft from HOUND would be Disney's own GREAT MOUSE DETECTIVE, which managed to crowbar entire scenes from SHERLOCK HOUND - and what it didn't steal from HOUND, it swiped from CASTLE OF CAGLIOSTRO. But I digress. Suffice to say that HOUND is probably the only show that can utilize painstaking recreations of Victoria Station circa 1901 AND Space Invaders sight gags. Why only the Japanese and the Italians could produce the quintessential Sherlock Holmes cartoon is a question better left answered by semiotics professors or popular culture majors, and why it stars talking dogs is probably not going to be touched except by somebody's overpaid psychologist; and why the whole mess actually works is a completely different story altogether. While not as thrill-intensive as your typical robot cartoon or sci-fi epic, HOUND succeeds with its own brand of tweedy, low-key adventure. Of course there are some who won't find HOUND a masterpiece. Sherlock Holmes fans, in particular, aren't going to be very impressed, because as near as I can figure HOUND barely gets within striking distance of any of Sir Arthur Conan Doyle's actual Sherlock Holmes stories. I don't particularly consider this a deal-killer - how many LUPIN III episodes are based on Maurice LeBlanc's actual LUPIN stories? - but it's refreshing to see a show obsessed with background accuracy yet blissfully unconcerned about actually giving us a Red-Headed League, or for that matter, a Hound of the Baskervilles. Yet, comparing HOUND with Holmes gives us some insight into the transformation from human sleuth to dog detective. The human Holmes is, to be blunt, kind of a jerk. He's an arrogant know-it-all with a big nose; tough to wrap a children's cartoon around, to be sure. I certainly can't see Doyle's Holmes spending quality time with children the way Miyazaki's Hound does. However, let's face facts; if I was a big fan of nineteenth-century English literature, I wouldn't be reviewing many Japanese cartoons. Even though this DVD features very little in the way of extras or special goodies - very little meaning, absolutely nothing - the quality of the animation and the charm of the show itself make SHERLOCK HOUND well worth sniffing out. While the DVD is currently out of print in the United States, streaming episodes of SHERLOCK HOUND are available on streaming video. So be sure and enjoy your 1980s Japanese cartoon based on 1890s fiction with the technology of the 21st century! Professor Moriarty would be proud.